Many people have heard of individuals using dogs to assist them with their visual difficulties, but the use of dogs for people who are Deaf and Hard of Hearing is less understood by the general public. Hearing dogs for the deaf alert their owners to sounds, both inside and outside of the home. Some deaf people also choose to get hearing dogs for safety reasons. The general public's lack of understanding about dogs for the deaf has been known to cause a problem for some hearing dog owners. Some restaurants or stores where the owners are not aware of the current Americans with Disabilities Act (ADA) laws, have either told deaf owners to leave their dog outside, or refused them service. Some have even gone as far as saying, "You clearly aren’t blind! Why do you need a dog?" These dogs are assistance dogs that have been very well trained and are not just your average pet with a vest on them. It is the owner’s responsibility to keep them well groomed and to monitor their behavior, but because of the extensive screening and training process these dogs go through, disruptive behavior is rarely a problem. These dogs are trained to alert their owners of different sounds such as a siren, fire alarm, crying baby, telephone, or car horn. It is through the use of these dogs that many deaf people say they become more independent and interactive with their surroundings. 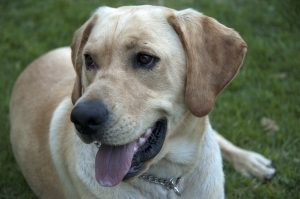 The dogs are trained to learn obedience, correct response to sounds, and how to respond to voice and hand signals. There are resources out there to educate yourself about assistance dogs of all types and the laws that apply to them. Assistance / service dogs have also been known to work with individuals dealing with mobility assistance, seizure alert, medical alert, autism and psychiatric issues. Dogs for the Deaf, Inc.: An organization that rescues and professionally trains dogs to help people and enhance lives. The story of Willa Macy, who lost her hearing when she was 14, and Honey, a golden retriever, who helped her to discover a new world of independence and security. It is also a story about Hearing Dogs - their background, training, special abilities, and the unique relationship they develop with their owners. A book for children about a deaf 9-year-old boy Luke and his hearing dog. Written by a hearing dog trainer, the book includes tips, trainer's secrets, and why hearing dogs are the fastest-growing facet of the assistance dog industry. I am very lucky, and very grateful to have a "Hearing Dog," an eight-pound, white, Maltese named Boomer (but I call him Chappy). He is a fabulous little creature who loves people, and loves doing his "job" and receivng treats when he does so. Boomer was rescued from a shelter in Ventura County, CA by the folks at the Sam Simon Foundation (in Malibu), trained as a hearing dog, and then given to me free-of-charge. The Sam Simon Foundation is fully and independently funded by its founder, Mr. Sam Simon. Your are entirely correct in stating that many, many people are not aware of "hearing dogs." Boomer is a little cutie and he attracts a great deal of attention when we are out and about, and many people ask me about him. People are frequently not only surprised to learn about hearing dogs, in general, but also surprised that such a little guy can serve as an assistance dog -- but since I do not need any physical assistance, size is not an issue. I have had only a bit of difficulty with business owners over the past 19 months; most business people are fully satisfied when I explain that Boomer is a hearing dog. For those who are doubtfu, the foundation provides wallet-sized, laminated identification cards. Mine has Boomer's picuture on one side and my picture on the other side, along with the name, address, and web address of the foundation. I am always m ore than happy to answer questions about my hearing dog, and to show our ID card. Only once did a restaurant owner refuse to serve me (I called the police and an officer came out and informed the owner that he was in violation of federal law ... but I chose to eat elsewhere that evening). The foundation's Web address is www.samsimonfoundation.com. This foundation works only with California residents, but interested persons can find much valuable information there, regardless of where they live. Recently I visited with a group of parents of young deaf children who were sharing their frustrations and struggles with learning sign. They were asking for tips to improve their skills as their families learn the language of their young deaf children. Their question is one that I hear often, and I know I have addressed it in previous blogs, but because I hear it so much, I thought it might be good to discuss it again. I will also point out a feature from our site that might help bring some clarity to the issue. The parent's confusion was with the idea of how one sign can mean one of many English words AND how to know which English word to voice when the sign that they use could have multiple English translations. Let's use the word FINISH for an example. If you pull up this word on Signing Savvy, in the "This sign is also used to say" (blue) box near the bottom of the page, you will see that this sign can also be used for ALREADY, COMPLETE, DONE, and ALL DONE. This concept becomes difficult for new learners of the language to comprehend because they are used to all of these words being said differently and spelled differently in the English language. 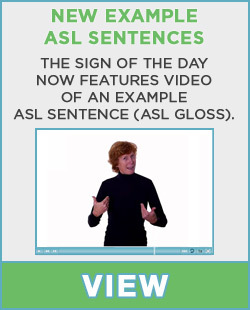 Remember, sign language is a visual language and many times if the concept that is being signed is conceptually correct, you don't need to worry if the word you are going to say is exactly the right English word, as long as the meaning of the concept is conveyed. To further emphasize this point, if you sign FINISH after the sign HAVE, as in HAVE FINISH, you are changing HAVE into the past tense form of that word, which is HAD. This also works with DO (DO FINISH = DID) or pretty much any verb that you want to make into a past tense. If the child were to sign: BOOK READ FINISH, you could voice, "I already read that book" or "I finished reading the book" or " I am done with my reading." Hearing people get all worked up over which one is right but to a deaf person, they are probably going to say that the concept is clear - the reading of the book is finished. The exact English words aren't important as long as the concept is understood. So think broad, focus on the concepts and the big picture, don't get too wrapped up in English word-by-word breakdown, after all ASL is not English.....oh and breath! When I first took an ASL class, I thought in terms of "pigeon English" rather than Exact English. I always imagined Tonto (from the Lone Ranger) with his phrases like "Me go now" etc.